The physical causes of climate change, and what needs to be done in order to stabilize the climate, are being addressed by science. But when the issue is felt from a broad perspective, the true spiritual nature of the problem becomes apparent with staggering simplicity. The issue is of a civilization that has been so busy with its own selfish, materialistic greed that it has forgotten that its very survival depends entirely upon the planet it lives on. A civilization that forgot that the mother Earth is a living being much more advanced and complex than us, which needs to be nurtured and respected for our own protection and spiritual advancement. Therefore, the only real lasting solution for the environmental crisis will come about via the correct recognition of the cosmic relationship between humanity and the Earth. In this sense, the problem we face is a clever way (and perhaps the only way) of forcing humanity to evolve out of its present materialistic selfishness, by the scientific recognition that either we change or we will kill ourselves. This is a direct application of karmic law. We deviated from true spirituality and chose a model of life based on materialistic selfishness. Now the Earth reminds us that this path is not the way to go into the future, and that life will become impossible unless selfishness is transmuted into actions that are to benefit all living beings, instead of just small groups, as well as the Earth itself. Some advocates of extraterrestrial disclosure say that climate change will put tremendous pressure on governments to make full disclosure as soon as possible, because we will then be able to learn more about clean “higher dimensional energy” used by our neighbors from space, and eventually use it to help solve the energy and environmental crises. While this is true, we must not forget that we were told by the Cosmic Masters that we have to karmically earn the right to use higher forms of energy before we can tap into this power. As long as we remain a selfish and war oriented race we will be a risk to the peace and stability in the Solar System, and will not be entrusted with cosmic secrets. So while the pressure for disclosure arising from climate change is a good thing, we must not forget that we have to change within our hearts first. As our cosmic neighbors made very clear, they will come down and help us clean up the environmental mess we have created only when we invite them with our hearts, and as a peaceful and unified planetary race that has a genuine love for the Earth. If the true motive is to have access to their technology, while remaining selfish and spiritually blind in our hearts, they will not make open contact or help anymore than what they are already doing behind the scenes. Note that we said ‘help us clean’, and not ‘do the job for us’. As discussed in the Diamond Principle section, our higher dimensional cosmic neighbors made contact with several initiates and government and church representatives in the 1950s in order to convey that we are not permitted to destroy the planet with nuclear weapons under any circumstances (this being a decision of the Galactic Council). Other than that, they will not interfere or solve the environmental crisis for us, not even if governments did make full disclosure. We certainly have to find new paradigms of living and restore the environmental equilibrium of the planet ourselves. In addition to this, the Earth is under the cosmic jurisdiction of its own hierarchy, the so-called ‘Great White Brotherhood’, as well as the higher dimensional beings of the inner Earth. As far as we understand the latest cosmic moves, based on our own contacts (see cosmic contacts timeline), Ashtar Sheran and other galactic Masters are now referring all initiates back to the spiritual hierarchy of the Earth, broadly represented by the Masters Morya and Koot Hoomi. This move clearly signals that that our cosmic neighbors want us to contact our own spiritual hierarchy, and the inner Earth, starting a concerted environmental cleanup with their assistance, before further help and teachings from space can be offered to us. This is only logical, and represents the correct flow of the spiritual-hierarchical energies. To put it simply, space will only be fully available to us when the Earth is consciously unified, and its citizens not only accept the existence of the Earth’s spiritual hierarchy, but also are consciously collaborating with its efforts. The students of the Secret Doctrine should note that only the Earth Masters had been introduced in the late 19th Century, when the Secret Doctrine was given to Madame Blavatsky. At that time it was not clear that an extraterrestrial intervention by the galactic Masters was going to be necessary due to the idiotic explosion of the atomic bombs. As many initiates already know, the issue of ‘climate change’ as commonly understood in its broader global environmental challenges sense is currently being used by all the hierarchies (Galactic, Solar System and Earth) to show us why true spirituality (i.e., unselfish living and correct recognition of the relationship between humanity and the Earth) is required in a very practical way, and what the consequences are when we deviate from the path. This is what Ashtar Sheran meant when he told us (see the works of Paulette Reymond in Switzerland) “the new age will come out of practice, and not because of theoretical spiritual appreciation”. Ashtar said that this would happen incredibly quickly by cosmic standards. We can already see how climate change is literally forcing the dawning of a new planetary awareness, with many paradigm shifts in business, technology and human relations. Interestingly, we can also see that this new planetary awareness is coming about primarily by scientific effort, which is demonstrating on a physical proof-basis what the results of our actions have been on the environment. According to the cosmic Masters, this is how our souls have collectively chosen to experience the planetary transition in consciousness, i.e., we have deliberately chosen to experience it by scientific effort. No doubt this is a hard lesson, but a lesson that we karmically deserve, and hence have to go through. Let’s have great courage to go through this experience as a unified planetary race, using the opportunity brought by the environmental crisis to recognize that the present model of our western society is wrong, then starting a new age of less selfishness and less materialistic madness, with much greater respect for the Mother Earth, and a greater appreciation of the cosmic brotherhood between us, our planet and all inhabited worlds around us in our Solar System and beyond. Then, and only then, we will be entrusted with the control of cosmic forces and given full access to space travel at speeds much superior to the speed of light. Students of the new age should also notice that the international climate agreement reached at the 2015 United Nations Climate Change Conference in Paris was signed on the 12th of December, i.e., the 12-12 code frequency of the new age. While far from perfect, this agreement is a first major step forward in bringing a large fraction of countries of the Earth working together towards a new age of less selfishness, and greater environmental awareness. The climate change and environmental crisis lesson is being deeply transferred into the mass consciousness of humanity as a whole, and will ultimately be the catalyst towards the prophesized new age. This change will come about from “bottom up”, that is, governments will have no choice but to surrender to the new consciousness and aspirations of the race. For more information about the higher dimensional meaning of the code 12-12 please refer to Q&A 35 from the readers. Master Morya: Master “Morya” (Great White Brotherhood, the Earth’s spiritual hierarchy) as seen by clairvoyant artist Celaya Winkler (USA), circa 1981, all rights reserved. This Indian man is an Earth Master, who is a prominent member of the ‘Great White Brotherhood’ (i.e., the Earth’s spiritual hierarchy) working in close association with the Master Koot Hoomi. The Master Morya works with the first ray of divine will power, particularly towards the establishment of divine governance on Earth. He is actively using the opportunity brought by the environmental crisis in order to facilitate the arrival of the new age, by showing humanity why unselfish living and the correct recognition of the relationship between humanity and the Earth is necessary in a very practical sense. 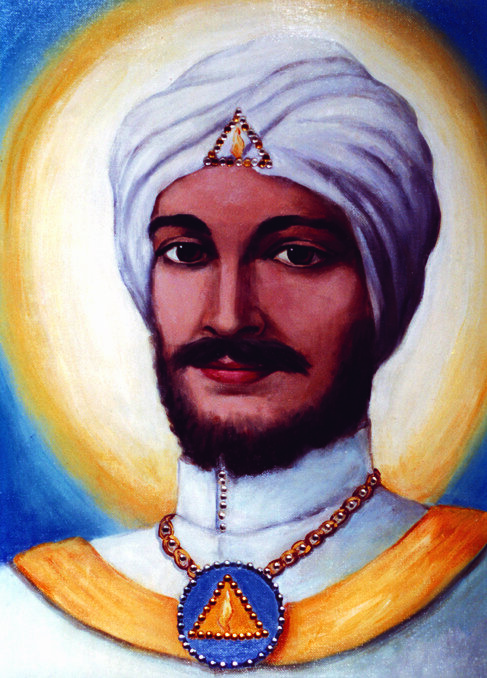 The Master Morya has made contact with Alex Light, introduced by Galactic Master Ashtar Sheran, in February 2015 (see cosmic contacts timeline).